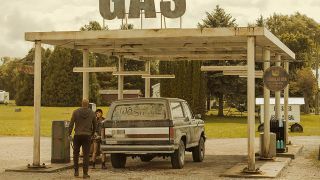 At last: an episode of American Gods where we see what the show can do when it puts its mind to it. Though it’s not without flaws, Muninn overcomes the issues of previous episodes by centering mainly around one key plot point – finding Argus (Christian Lloyd), the god of sight (i.e. surveillance, cameras, drones – you get the idea), with a couple of side stories accompanying this main quest. 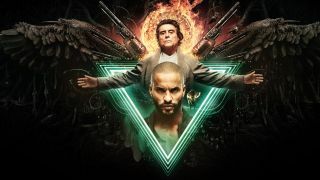 With both the New Gods and the Old trying to find Argus (and get him on their side), while Shadow Moon (Ricky Whittle) tries to find Mr Ibis (Demore Barnes), the exploits of Mad Sweeney (Pablo Schreiber) and the Salim-Jinn (Omid Abtahi and Mousa Kraish) pair complement the main story thread rather than confusing it. Honestly, it’s a relief. Warning: There are minor spoilers for the episode below, so read at your own risk! Laura (Emily Browning) brings out the best in whichever character she’s with, and this is the episode where it really shows. She’s tagging along with Mr Wednesday (Ian McShane), who promises to breathe life back into her heart, and her straight talking means that we get a very clear picture of how Mr Wednesday sees Laura and Shadow’s relationship. Laura doesn’t have patience with Mr Wednesday’s enigmatic speeches, and the answers she gets help to clear things up for those of us watching the episode too. Thankfully their quest to find Argus is the main focus of the episode, and it’s refreshing to see Mr Wednesday come up against someone whose tenacity is almost a match for his – though of course, that’s why Mr Wednesday has it out for Laura. Plus, while I’m on the subject of rivalries, having Tech Boy (Bruce Langley) and New Media (Kahyun Kim) clash provides some much-needed character development for our toad-smoking, kinda bratty tech wizard. At one point in the episode you could very, very briefly see Tech Boy beginning to scheme just like his boss, Mr World (Crispin Glover). Clearly threatened by New Media’s ambition, we’re starting to see his competitive side emerge, which will hopefully make for a rivalry with New Media that’ll develop both characters more beyond just attention-seeking brats. Sure, the New Gods are meant to be cocky, but getting a deeper glimpse of their characters makes it a lot harder to simply dismiss their side of the war, especially when you can see that Tech Boy is forming his own agenda. Basically, give me more of Tech Boy now that he’s not the star child to the almost parent-like figures of Mr World and Media (Gillian Anderson) from season 1. Please. Finally, finally, in Muninn we get to see a brief burst of Shadow’s personality, and it’s glorious. Sweet-talking, charismatic, and slippery without a doubt, his conman side makes an appearance before he’s actually upfront with Sam Blackcrow (Devery Jacobs). Having a non-binary character in the episode is a swell nod to the LGBTQ community too, and Shadow – in a moment that made me almost whoop for joy – actually started to interrogate her instead of just going with the flow. I don’t blame him, to be honest. Abducted, tortured, surviving a train crash: at last Shadow has had enough. Clearly their meeting has had a lasting impact on him too, as his reaction to seeing Mr Wednesday implies that he’s starting to ask all the right questions – though he doesn’t push Mr Wednesday nearly enough. Baby steps, Shadow. Baby steps. Look below to watch our video about the TV shows of 2019 you should keep an eye out for, or here’s the best TV shows on Amazon Prime that you can watch right now!